Helsinki Airport (IATA: HEL, ICAO: EFHK; Finnish: Helsinki-Vantaan lentoasema, Swedish: Helsingfors-Vanda flygplats) is the main international airport of the city of Helsinki, its surrounding metropolitan area, and the Uusimaaregion. 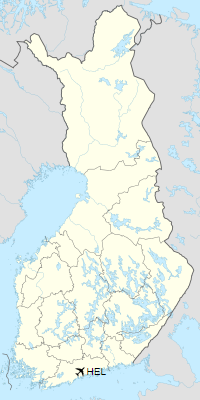 The airport is located in the city of Vantaa, about 5 kilometres (3 mi) west of Tikkurila, the administrative center of Vantaa and 9.2 NM (17.0 km; 10.6 mi) north of Helsinki city center. 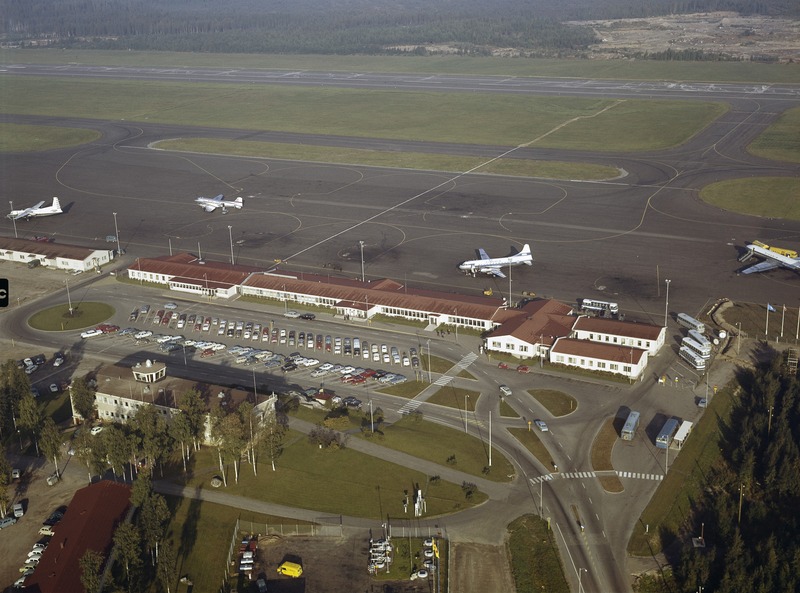 The airport is operated by state-owned Finavia. 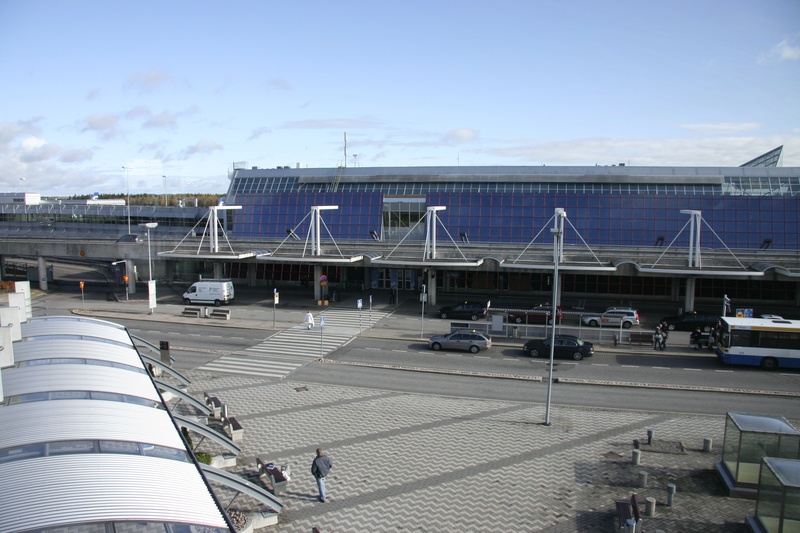 The airport is the largest in Finland and the fourth busiest in the Nordic countries in terms of passenger numbers. About 90% of Finland’s international air traffic passes through Helsinki Airport. The airport handled close to 21 million passengers in 2018, including 17.9 million international passengers and 3.0 million domestic passengers. On average, the airport handles around 350 departures a day. 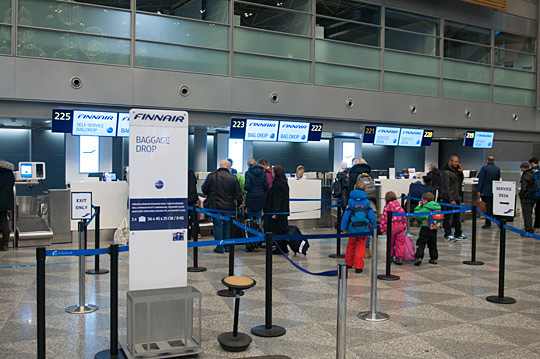 The airport is the main hub for Finnair, the flag carrier of Finland, and its subsidiary Nordic Regional Airlines. It is also a hub for CityJet (on behalf of SAS), Jet Time, TUI fly Nordic, and an operating base for Norwegian Air Shuttle. The airport is also a focus city for Thomas Cook Airlines Scandinavia. 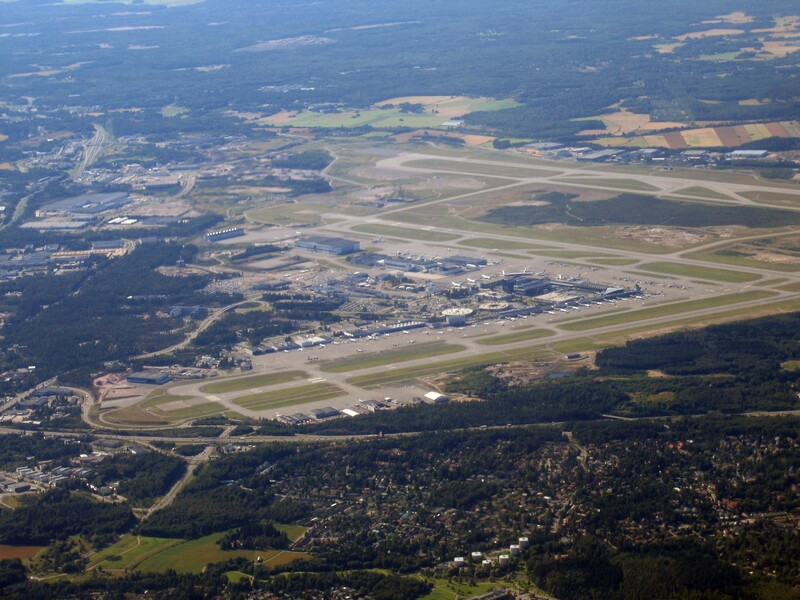 Helsinki Airport has around 50 regularly-operating airlines. The airport has around 80 scheduled destinations to other parts of Europe and 21 direct long-haul routes to Asia, the Middle East, and North America. There are also 35 charter destinations including numerous long-haul charter destinations.Currently, Helsinki Airport has two terminals with a total of 29 gates with jet bridges and 80 remote aircraft parking stands. Finavia aims to strengthen the position of Helsinki Airport in transit passenger traffic between Europe and Asia, and to increase the number of direct connections to Europe. 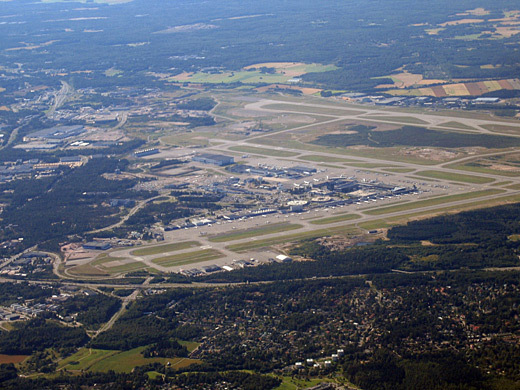 Helsinki Airport’s minimum transit time of 35 minutes is among the shortest in Europe. According to Finavia’s survey, as many as one in every three passengers select their flight route based on the transit airport. Airline passengers have several times chosen Helsinki Airport as one of the best airports in Europe. In March 2018, Skytrax World Airport Ranking elected Helsinki Airport as the best airport in Northern Europe. The planning of a new airport for Helsinki had already begun in the 1940s, when it became obvious that the old airport at Malmicould not handle the increasing number of passengers or the new, heavier aircraft. A new site was found some 20 km from Helsinki city centre, in an area that today belongs to the city of Vantaa. It opened temporarily in July 1952 for that year’s Summer Olympics, held in Helsinki. The year 1973 saw the first security checks being carried out for international flights. The name Helsinki-Vantaa Airport was taken in use in 1977. In 2000, the airport handled over 10 million passengers for the first time in its history. The third runway was inaugurated on 28 November 2002 and the first user was Finnair’s McDonnell Douglas MD-11 en route to New York. In 2004, the international terminal was again expanded and a new shopping area was opened for long-haul passengers. 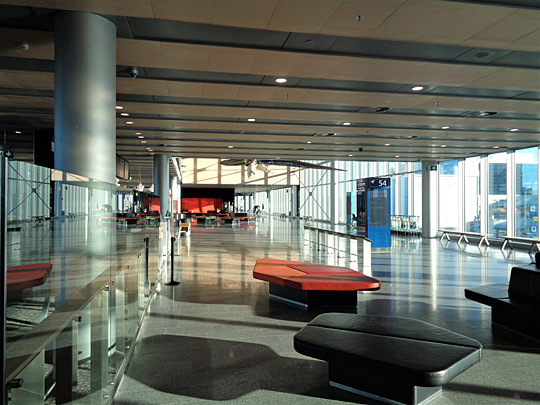 In 2009, the latest expansion of Terminal 2 was completed. The total floor area was 43,908 square metres (472,620 sq ft). The same year witnessed the opening of a new shopping area and spa for passengers on long-haul flights, the removal of a terminal-specific division between domestic and international flights, and the renovation of Terminal 1 for international flights. In the same year, TAP Air Portugal commenced service between Helsinki and Lisbon. In April 2010, Norwegian Air Shuttle opened its first routes to Oslo and Stockholm using Boeing 737 jets. Now the airline is one of the largest operators at the airport with almost 40 destinations in Europe, Asia and Africa. 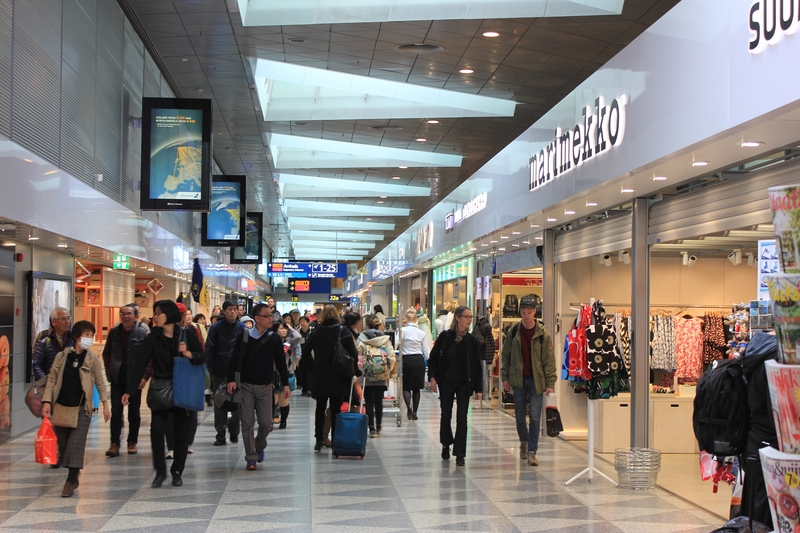 In 2011, Helsinki Airport saw its biggest growth in a single year in the number of passengers. The number of annual passengers was increased by 2 million passengers and the airport reached the milestone of 14 million passengers. However, easyJet canceled three routes, from Helsinki to Manchester, London–Gatwick and Paris–Charles de Gaulle, citing weak demand at the Helsinki. In November 2011, Austrian Airlines canceled its Vienna–Helsinki operations. In the same year, Czech Airlines ceased its Helsinki operations due to low demand. A year after, LOT Polish Airlines canceled its service to Helsinki. In 2014, a number of airlines such as Aer Lingus, Germanwings, S7 Airlines and Wizz Air canceled services to Helsinki. In the beginning of 2015, the renovation and construction work related to the development of Helsinki Airport started. 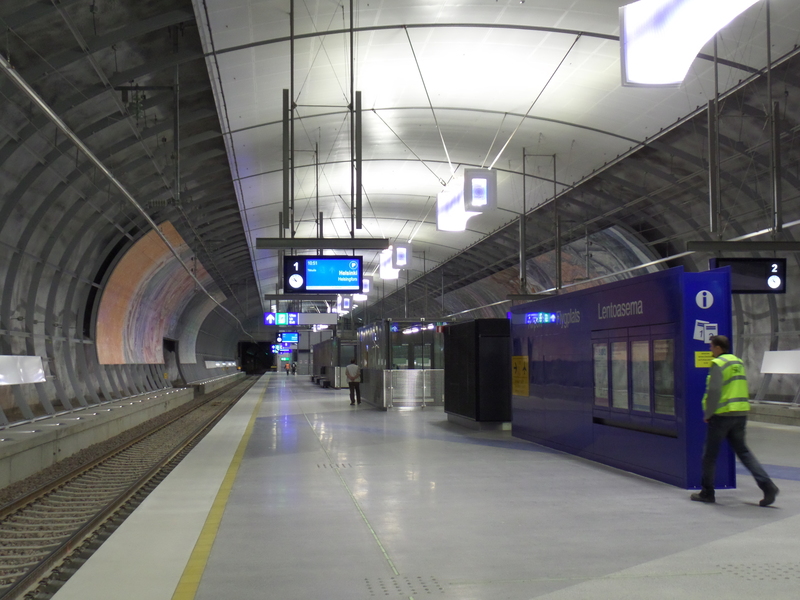 For example, the Baggage Claim Hall 2B and Arrival Hall 2A were renovated and in July 2015, train operation on the Ring Rail Line and connection to Helsinki Central Railway Station were opened. In March 2015, Swiss International Air Lines started operations to Helsinki but canceled it a year after. In late 2015, Blue1 ceased all operations from Helsinki which was the airline’s only base. The airline flew to 28 destinations in Europe. Scandinavian Airlines sold Blue1 to CityJet, which continues to operate the company on behalf of SAS as part of a larger relationship. In 2015, the airport handled up to 16 million passengers for the first time. In March 2016, Czech Airlines resumed flights from Prague to Helsinki using Airbus A319 aircraft. On 10 October 2016, the first Gulf carrier Qatar Airways began operations at the airport and now operates to Helsinki by Boeing 787 Dreamliner. The carrier was initially planning to launch the service as early as in 2012. On 27 October 2016, Norwegian Air Shuttle announced intentions to double its flights from Helsinki within the next five years and plans to launch long-haul flights from the airport. Finavia expects that the airport will handle over 18,5 million passengers in 2017 and around 20 million in 2018, in 2019 at the latest. Also in 2017, the airport has experienced huge growth in numbers of passengers flying intercontinental. Life in HEL (#lifeinhel) was a Finavia marketing campaign which took place from 10 October to 9 November 2017 at Helsinki Airport. The campaign mixed TV, game shows and social media. Ryan Zhu, a Chinese actor and TV personality, lived in a little cabin inside Helsinki Airport for 30 days. Helsinki Airport was awarded the title of best airport in the world by Travellink; by the campaign, Finavia wanted to prove this claim. The airport is nominally divided into two terminals, located 250 metres (820 ft) apart and linked by an internal pedestrian connection both airside and landside. 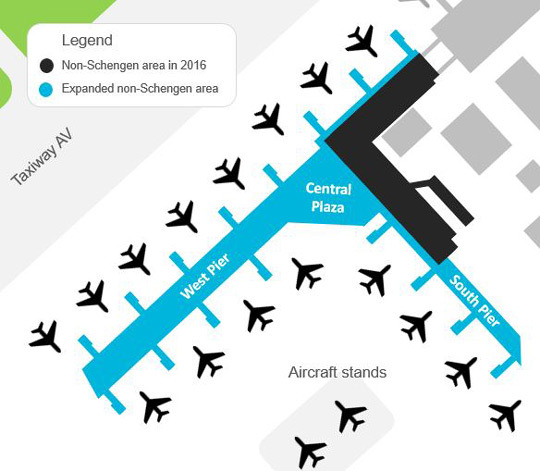 In practice, however, the airside parts of the terminal buildings are not divided into Terminal 1 (the former domestic terminal) and Terminal 2 (the former international terminal) but to Schengen and non-Schengen areas. 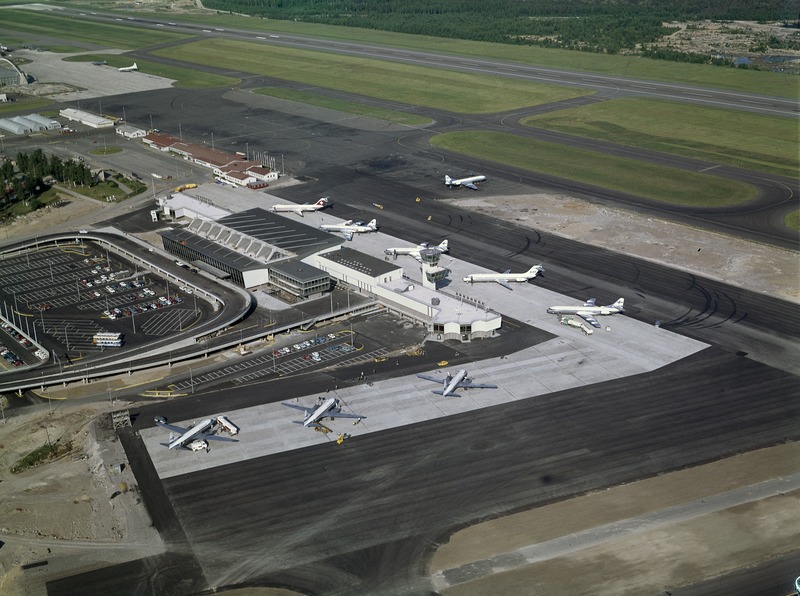 The terminal capacity of the airport is approximately 16–17 million passengers per year. 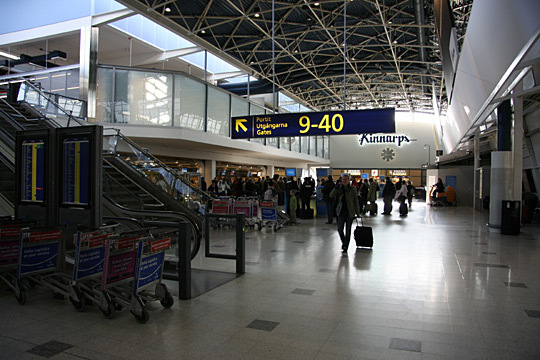 Domestic flights, as well as flights to European Schengen countries, are operated from gates 11–31. Long-haul and European non-Schengen flights are operated from gates 31–38. As the terminal extension is completed, the airport will have 60 gates altogether with 19 gates in Terminal 1 and 41 in Terminal 2. The airport’s signage is in English, Finnish, Swedish, Korean, Chinese, Japanese, and Russian. Terminal 1 (gates 5–15, as of 2020 gates 1–15) has 11 gates of which four are equipped with jet bridges. The terminal opened in 1952 and is the first terminal at the airport. Now the old terminal building is removed and replaced by the current terminal building. The terminal was used for domestic flights but as of 2009, it is also used for international flights. 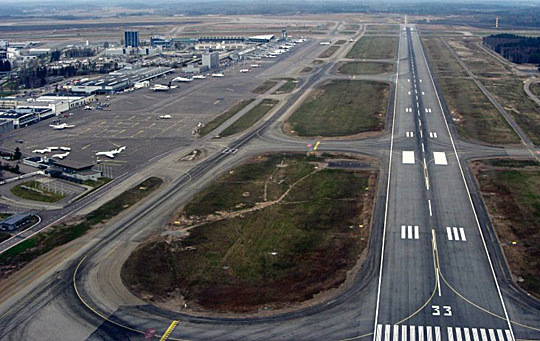 Terminal 1 is used by Star Alliance carriers, such as Aegean Airlines, Croatia Airlines, Lufthansa, Scandinavian Airlines, and TAP Air Portugal. In addition to Star Alliance members, airBaltic and Vueling also operate flights from this terminal. 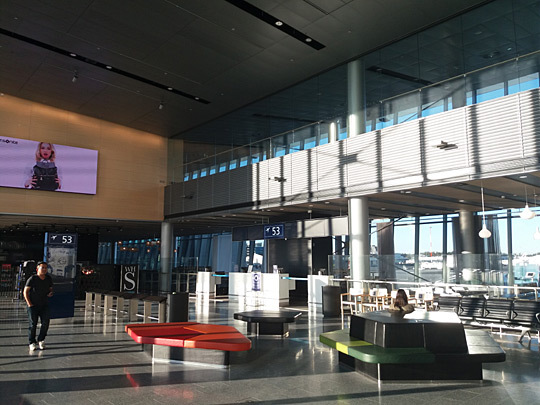 Previously, Icelandair operated its services to Reykjavík from this terminal but moved to Terminal 2 on 13 April 2015. Currently, no carriers operate long-haul flights from Terminal 1. The terminal has a train connection to Helsinki Central railway station. Terminal 2 (gates 16–55) opened in 1969 for international operations and, at present, also serves domestic flights. It is the larger of the two passenger terminals at the airport. All intercontinental flights operate from Terminal 2. The non-Schengen area of Terminal 2 has been enlarged in 2009 enabling the airport to accommodate eight wide-body aircraft at gates simultaneously while a new shopping area and a spa were opened for passengers on long-distance flights and the division between domestic and international flights was removed. Terminal 2 has many restaurants, bars and shopping areas. The terminal is equipped with 26 aircraft parking stands with passenger bridges. The terminal has a train connection to Helsinki Central railway station. Terminal 2 passenger facilities include: numerous tax-free shops, Avis, Europcar and Hertz-car rentals, free wireless Internet access, power sockets, lockers, sleeping pods and transfer service desks. Currency exchange, cash machines (ATM), tourist information, an Alepa grocery store and pharmacy are also available. For children, there are also several playrooms. 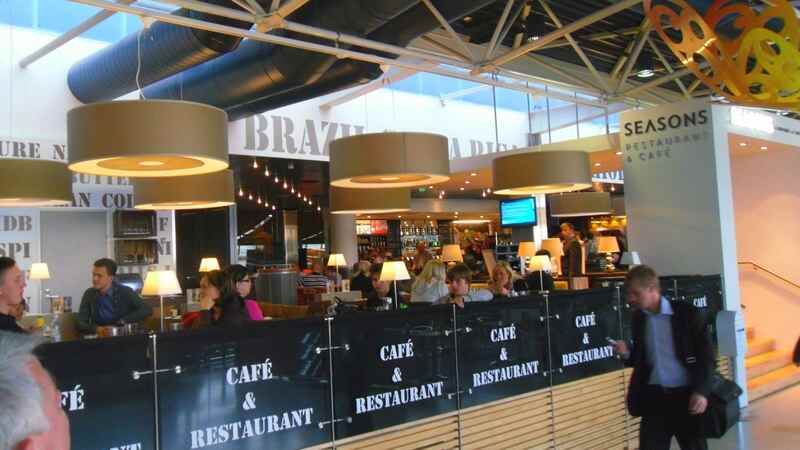 Dining facilities include Burger King and O’Learys Sports Bar as well as numerous other restaurants and cafés. 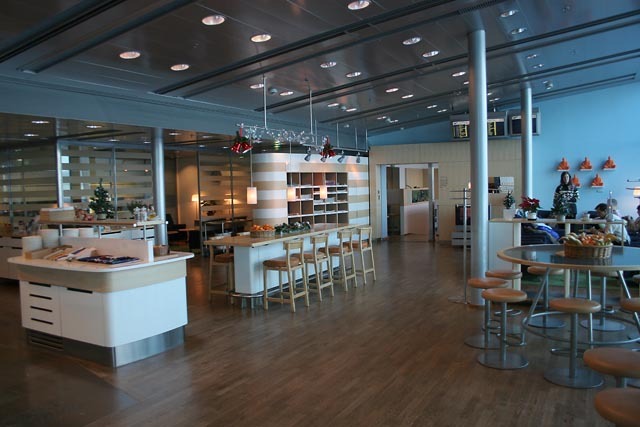 Terminal 2 also includes two Finnair lounges: Finnair Lounge in the Schengen-area and Finnair Premium Lounge in the non-Schengen area. There are several airport hotels and office buildings on the grounds of the airport. The Aviapolis is a new international business park adjacent to the Helsinki airport area, already hosting the operations of numerous companies around the airport. 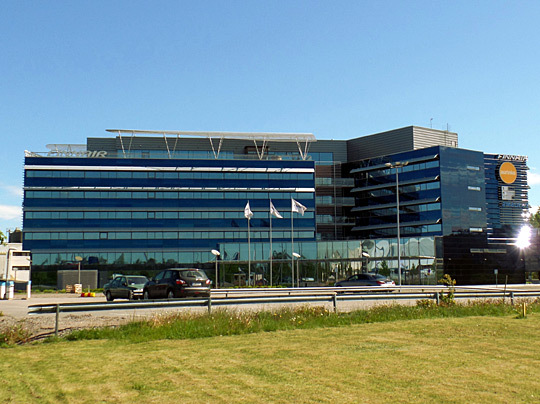 In 2013, Finnair opened its new head office, known as House of Travel and Transportation, or «HOTT». The construction of HOTT began in July 2011 and finished on time in June 2013. 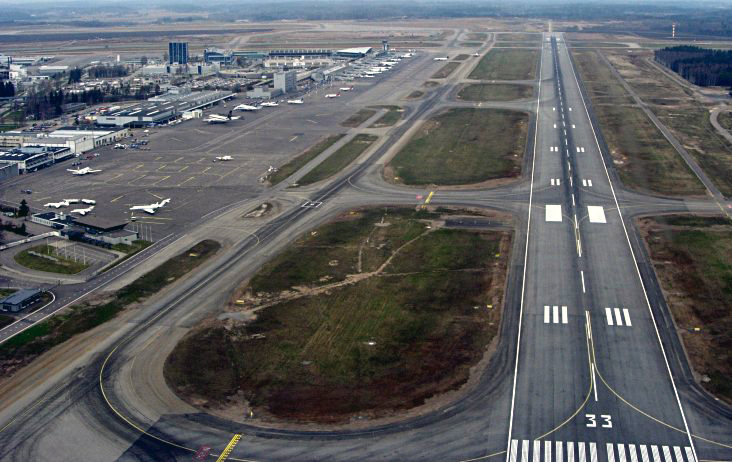 Helsinki Airport has three runways: Runway 1 (04R/22L), Runway 2 (04L/22R) and Runway 3 (15/33). Runway 1 is 3,500 metres (11,483 ft), Runway 2 is 3,060 metres (10,039 ft) long and Runway 3 is 2,901 metres (9,518 ft) long. The runways can handle take-offs and landings of the heaviest aircraft in use today such as Airbus A380. The use of three runways allows two runways to be kept in operation when clearing of snow and ice is needed (if one runway is being cleared at a time). Helsinki Airport is connected to over 140 destinations worldwide and over 50 countries by passenger services. Helsinki Airport has around 50 airlines operating regularly. In addition, there are numerous charter airlines operating at the airport. The airport is the main hub for Finnair, that operates over 1100 flights weekly to Europe, Asia and North America. The airport is also used as an operating base for Norwegian Air Shuttle and the low-cost airline operates over 230 flight weekly to elsewhere Europe as well as to the United Arab Emirates and Morocco. Finnair is the largest airline operating at the airport, with an all-Airbus fleet of 48 aircraft (excluding Norra) based at Helsinki, providing scheduled services to the Middle East, Asia, Europe and North-America. Finnair operates flights from Helsinki to over 100 destinations, including around 20 intercontinental routes. All flights are operated from Terminal 2. TUI fly Nordic, a charter airline that operates to Southeast Asia, Europe and Caribbean in North-America. The airline operates from Terminal 2. On 10 September 2018, TUI announced plans to close its Helsinki base in the near future with Jet Time taking over the company’s short-haul operations at the airport. The passenger number has been growing fastly since 2010, but especially since 2014. In 2017, Helsinki Airport has experienced the third highest growth rate and the second biggest increase in passenger numbers in the last 20 years. On 13 December 2017, the airport reached the milestone of 18 million passengers first time ever. TNT Airways Boeing 737-400F aircraft at its cargo terminal and DHL Aviation A300-600F in the background. Helsinki Airport has extensive cargo flight activity. There is a cargo area with cargo terminals and cargo transit facilities in the Southeastern part of the airport area. 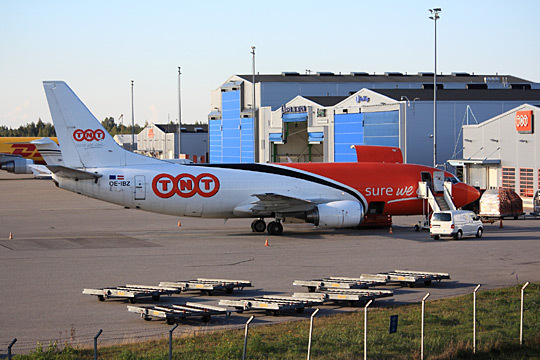 ASL Airlines Belgium (formerly TNT Airways) and DHL have their own cargo terminals at the airport. Currently scheduled cargo operating airlines are AirBridgeCargo Airlines operated with Boeing 747 cargo aircraft, ASL Airlines Belgium, DHL Aviation (operated by EAT Leipzig and DHL Air UK), FedEx, UPS Airlines and Turkish Airlines that operates cargo services to HEL from Istanbul, Oslo and Stockholm with Airbus A310F and A330F aircraft. In addition to scheduled cargo operations, many other cargo airlines have random operations at Helsinki Airport. The construction of a new freight terminal (35,000 m2 or 380,000 sq ft) began in March 2015 and will be inaugurated on 8 January 2018. The capacity of the terminal is 350,000 tonnes but the theoretical capacity is up to 450,000 tonnes. The freight capacity of the airport is being expanded to accommodate the growing freight capacity that will be provided by Finnair’s Airbus A350 XWB fleet. Finnair’s freight operations continued in the previous location until relocation to the new freight terminal in December 2017. The name of the new terminal is Cool Nordic Cargo Hub, but is branded COOL for its modern technology and capacity to handle high volumes of temperature-controlled cargo. A new operations monitoring and tracking platform, «Cargo Eye», is used in the new freight terminal. That gives the new Cargo Control Center a live view of what is happening across the cargo network and where everything is located. The terminal has 29 stands for truck transports. Long-haul traffic stands at a major role at Helsinki Airport. The airport saw its first long-haul route on 15 May 1969 when Finnair commenced flights to New York City via Copenhagen and Amsterdam. The first non-stop route to East Asia was commenced in 1983 with Finnair’s flight to Tokyo, with Beijing following five years later. Within last eight years, the long-haul traffic has been increasing much measured by weekly flights, passenger numbers and destinations served. At the beginning of the decade, Helsinki Airport had only one trans-Atlantic service, to New York-JFK. In May 2011, Helsinki’s trans-Atlantic services enhanced as American Airlines opened a new summer seasonal service between Helsinki and Chicago, using the Boeing 767-300ER. However, the airline canceled service in 2014 as the route was converted to Finnair. In 2014, Finnair resumed service to Miami and in mid-2017, the airline re-connected Helsinki Airport to California after a long break by the new service to San Francisco. Recently, Finnair has been expanding outside the U.S with new scheduled services to Havana, Puerto Plata and Puerto Vallarta. In 2012, Helsinki Airport gained another daily service to Tokyo as Japan Airlines commenced service to Helsinki using Boeing 787 Dreamliners and in the summer of 2018, there will be up to three daily (21 weekly) flights to Tokyo. The airport gained its first Gulf carrier service in 2016 when Qatar Airways commenced the service. The airline started flying with Airbus A320 narrow-body aircraft but later also started operating with Boeing 787 Dreamliner wide-body aircraft. As of August 2018, the airline operates two daily flights between Doha and Helsinki. In October 2018, another Middle Eastern airline, flydubai, begins operating scheduled flights to the airport with a new year-round service to Dubai–International. Nowadays, Helsinki Airport is an important transfer airport between Europe and Asia. In 2016, Helsinki Airport handled approximately 2.7 million transfer passengers, which is around 5.2 percent more than in 2015. In total, there are 40 intercontinental routes to destinations connected to Helsinki Airport in Asia, North America, and the Middle East. Eight of all intercontinental routes are trans-Atlantic services to New York (JFK), Chicago, San Francisco, Miami, Cancún, Havana, Puerto Plata and Puerto Vallarta. As of May 2018, 22 of all 40 intercontinental routes are to Asia, including Astana, Bangkok, Beijing, Chongqing, Colombo, Delhi, Fukuoka, Goa, Guangzhou, Ho Chi Minh City, Hong Kong, Krabi, Nagoya, Nanjing, Osaka, Phuket, Phu Quoc, Seoul, Shanghai, Singapore, Tokyo and Xi’an. Five routes are to the Middle East, including Aqaba, Doha, Dubai, Eilat and Tel Aviv. The rest three routes are to Africa, including Banjul, Marrakech, and Mauritius. Over 100 weekly frequencies, operated by Finnair, Japan Airlines and Qatar Airways, are flown to Asia and the Middle East. Royal Jordanian, Thomas Cook Airlines Scandinavia and TUI Airways also operate intercontinental charter routes. Also, Norwegian Air Shuttle has announced that the low-cost airline considers starting long-haul operations from the airport by 2020. Helsinki Airport is ranked as the 29th busiest within Europe, serving over 18.9 million passengers in 2017. It is the fourth-busiest airport in the Nordic countries. Nonetheless, Helsinki has the largest number of Asian destinations of all Nordic airports and in 2015, the airport was the fifth busiest airport in Europe in terms of flights to Asia. When ranked by connectivity, the airport is the best-connected airport in Northern Europe with around 10,000 connections worldwide, 85% more than in Copenhagen which is the 2nd best-connected airport in the Nordics. The number of connections from Helsinki Airport has grown by 96% in a decade. In Europe, the airport is the 12th best-connected airport. 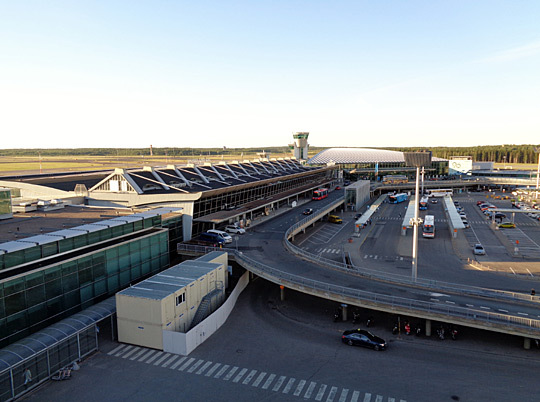 According to Airports Council International (ACI), Helsinki Airport is one of the fastest growing airports in Europe. Over the last few years, the number of passengers going through Helsinki Airport has grown significantly. In 2010, the airport handled 10,700,000 while by 2018, the amount of annual passengers has nearly doubled to over 20,800,000. Stockholm includes services to both Arlanda and Brommaairports. «Traffic statistics – Scheduled traffic» (PDF). Finavia. The railway link to the airport opened for traffic in July 2015 and serves local commuter trains running at 10-minute intervals during peak periods. The westbound commuter line ”I” runs to Helsinki Central station via Huopalahti in just over 30 minutes, while the eastbound commuter line «P» runs to Helsinki Central Station via Tikkurila in just under 30 minutes. 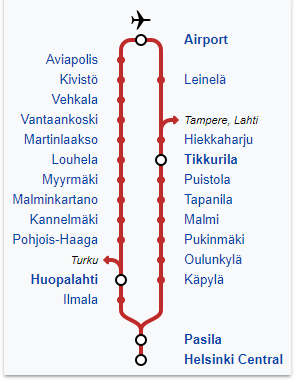 Eastbound trains stop at Tikkurila (8 minutes away) where passengers can transfer to long-distance trains going away from Helsinki, in the directions of Tampere and Lahti, including lines to Saint Petersburg and Moscow. Finnair Airbus A319 taxiing. Terminal expansion construction site in the background. Terminal 2 non-Schengen expansion site. The layout of the non-Schengen area in 2020. 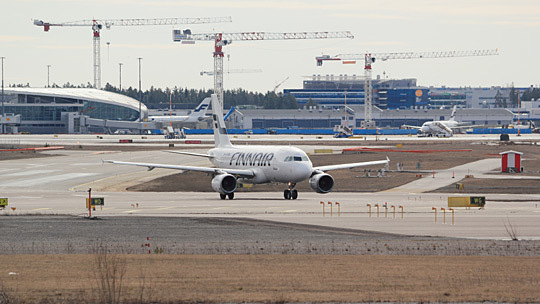 In October 2013, Finavia received a capital injection of 200 million euros from the Finnish state. The investment enabled Finavia to start a development programme worth of 900 million euros at Helsinki Airport, aiming at maintaining the strong position of Helsinki Airport in transit traffic between Europe and Asia. The programme started in January 2014 and is planned to last until February 2020. It is expected to generate about 14,000 person-years of employment. 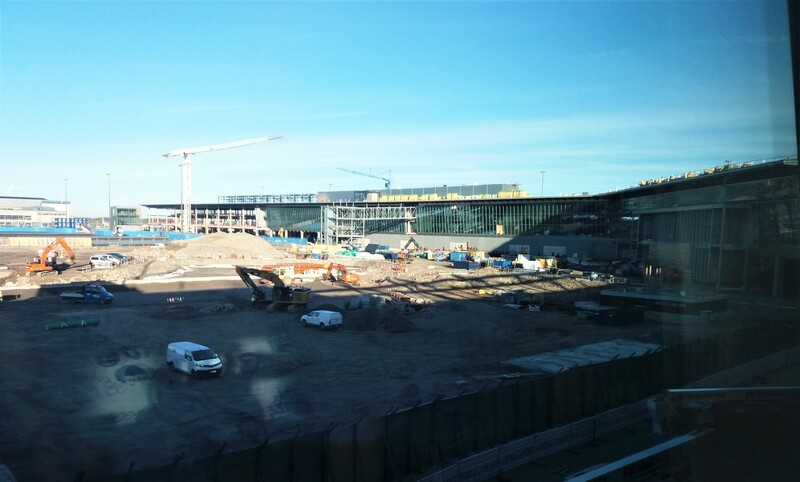 Helsinki Airport is expected to serve 20 million passengers per year by 2020 and add about 5,000 new jobs at the airport. The expansion will increase capacity at the airport to 30 million passengers. Finavia plans to expand Terminal 1, which is used for flights within the Schengen area. The construction is scheduled to be started in November 2017. Terminal 1 will be expanded by four separate departure gate buildings which will be connected by walking corridors. Each building will have one departure gate excluding one, which will have three gates. Gates (5–11) will not be equipped with jet bridges. Buildings will have two floors. In June 2016, the new bus terminal for remote aircraft stand operations was opened to increase the airport’s capacity with gates 50A-M.
On 20 September 2016, the construction on the West Pier began, even though it was expected to start in summer 2017. The construction of the west wing is expected to be finished in 2019. The west wing represents some EUR 300 million of Finavia’s substantial total investment of EUR 900 million. The first part of the west wing to be built is the large central plaza, which is scheduled to open in late 2018. It will bring 25,000 square metres (270,000 sq ft) of new passenger and baggage facilities to the airport. The pier will be equipped with nine gates for widebody jets. Gate 49, which will be able to accommodate the Airbus A380, is one of the gates in the South Pier. The construction of a new freight terminal (35,000 m2 or 380,000 sq ft) began in March 2015. The capacity of the terminal is being expanded to accommodate the growing freight capacity that will be provided by Finnair’s Airbus A350 XWB fleet. Finnair’s freight operations will continue in the current location until relocation to the new freight terminal in spring 2017. Part of the re-haul of Helsinki Airport has included the development of a contextual engine that uses artificial intelligence to digest passenger data in ways that make passing through the airport a more pleasant experience. 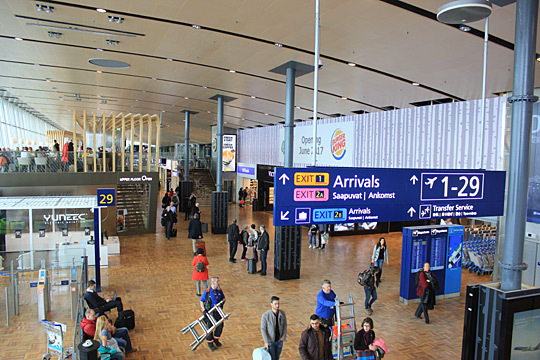 The benefits come from an array of small improvements; for example, digital signs change language according to the nationalities of those getting off a flight. Passengers are also continuously kept abreast of how long it will take them to reach their gates or pass through security control. Monocle named the contextual engine built by technology firm Reaktor as one of the top transportation innovations of 2018. In addition to the terminal expansion, Finavia has also contemplated building a third terminal at Helsinki Airport. According to Finavia’s tentative plan, the new terminal would be located between runways 04R/22L and 04L/22R, while runway 15/33 would be removed. The terminal would be the principal terminal at the airport but the check-in area would stay in the current terminal building. The decision to build the third terminal has not yet been taken.